HooToo HT-IP006N Review – Is It Worth Buying? 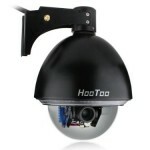 The HooToo PTZ PRO is a fine 2-way audio camera indeed which can be used for indoor and outdoor surveillance recording. It features a wide range of internet network protocols + multi browser support to configuring across your LAN or internet connection. If you have the Blue Iris App or TinyCam Pro then recording your footage and controlling the camera via remote monitoring is simple. IP Cam Viewer Pro & EvoCam seems to work best for those on you on a Mac. It has all the usual options you would expect from a pan, tilt, zoom camera; remote monitoring via your smartphone, tablet, internet software. 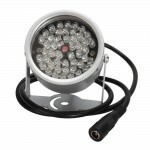 IR motion detection trigger + night recording capabilities courtesy of 11 super bright LEDs. The camera also records audio but if you want to remote monitor the audio live, so far the only browser that seems to allow this is Internet Explorer, once you download the free Microsoft ActiveX addon. If you continuously record at the 640×480 VGA setting you will use up about 500gb per week. You can over write the files if no events occur. You will get considerably more use out of your hard drive if you use motion detection or time scheduled recording. Poorly written manuals which assume knowledge of internet, router and advanced computer network configurations. 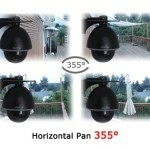 The little 3dbi antenna can cause the picture to drop out if your camera is more than 4 meters from your WI-FI box. An upgrade to a 9dbi antenna will solve the issue, but you will have to buy this independently. Night vision is not great as there are only 11 LEDs, you may want to purchase some additional night vision illuminators if you there are any essential areas you want your camera to see at night. Internet connection is still extremely difficult, you need a lot of patience setting these up. But customer support is great as with Foscam. Although the camera can be used outdoors, the ethernet, mic, power and speaker cable bundle are not weatherproof. You will have to house them in an enclosed box to shelter them from the elements. This should have been factored into the design. A descent robust camera from HooToo. The picture quality at this price point is fantastic. It works in ambient lighting conditions as low as 0.5 lux. The zoom and pan functions are incredibly smooth and responsive. Customer support is also great. The camera also pans to a near 360°, so all in all you get a fine weatherproof (albeit it without cabling protection) camera for under $300. On the plus side the image quality stays great when you zoom in thanks to the 3x optical zoom. The lens optics are good in this camera. If you ever see a camera with digital zoom on it stay away from it like the plague, as all it does is magnify the image pixels. This on the other hand uses the motorize zoom and produces fantastic results. Will look forward to a HD version of this camera. This is not a plug & play product so if you want to remotely control it outside your home you may find it tricky without some network protection, but hey, that’s what the support service is for.